Designed especially for energetic and physically fit adventure seekers looking for a combined trekking and climbing experience, Island Peak Climbing takes you to the pleasant and enticing cultural, spiritual and natural diversity of the Khumbu Valley in the Everest Region. Island Peak Everest base camp Trek package would be the ultimate test of the perseverance and agility. Trekkers will be climbers too and vice versa in this package. Bharal Adventure offers the enigmatic beauty of wilderness adventure up in the Himalayas. Island Peak Everest base camp Trek is one of the main climbing peaks in the Everest Region. Island Peak has an impressive and highly glaciated West Face rising from Lhotse Glacier. Designed very professionally keeping in mind the need for fulfilling proper and gradual acclimatization at suitable intervals, the itinerary of Island Peak Climbing will also take you to the Base Camp (5,357m/17,575 ft) of the highest mountain of the world, Mt. Everest, known as Sagarmatha in the Nepali language. Therefore, your Island Peak Everest Base Camp Trek package will be one of the best moments of your life. 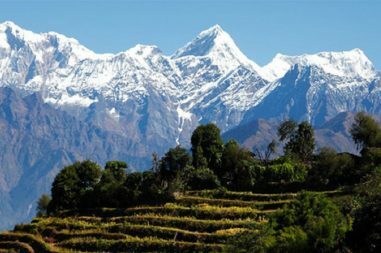 Since it’s an enormous opportunity to explore the peaks of Nepal and do trekking in Nepal. You will get on board on one of the most thrilling experiences of your life. You shall also be taken to possibly the most popular trekking destinations in the world. They are Everest Base Camp and Kala Patthar. 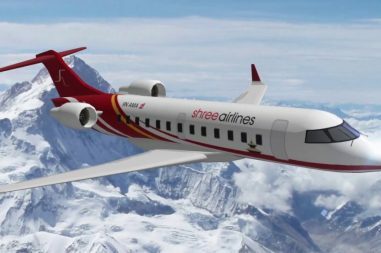 The 19 days journey begins from and comes to closure at the Lukla Airport in Everest Region, one of the most famous airstrips in the world. Therefore, We assure you best hospitality and quality services. The guests shall be greeted by a representative of Bharal Adventure who is responsible for taking them to their hotel upon their arrival. The dinner comprising of authentic Nepali food is the preliminary firsthand experience of the Nepali culture that the company offers you. Meeting with crew for trek preparation is also done on this day. Hiking through the villages of Benkar, Chumoa, Monjo and Jorsale, the team disembarks the entrance of Sagarmatha National Park. After passing the confluence of Dudh Koshi and Bhote Koshi Rivers, followed by a final steep ascent of about two hours, the team is rewarded with the first sight of Mt. Everest peering over the Lhotse-Nuptse ridge from where it takes an hour and half hike to reach Namche Bazaar. Exploration of Namche Bazaar itself could be done where the travelers will have a chance to discover and learn about the Sherpa culture, visit the museums, biodiversity of the Everest region and assortment of things related to the first Everest ascenders. Namche is the major trading center of the region that has restaurants, ATMs, a bakery and colorful market each Friday evening and Saturday. Also a few hours trip to Everest View Hotel could be taken from where the mighty Everest could be observed in close proximity. Also a few hours’ side trip to Khumjung Valley could be arranged where a visit to Edmund Hillary School and Khumjung Monastery (a monastery famous for housing the head of the Yeti) could be done. Enjoying the marvelous views of Mt. Everest, Mt. Nuptse, Mt. Lhotse, Mt. Ama Dablam and close up view of Thamserku, the trek from Namche Bazaar to Tengboche comes to an end. The team treks towards Pangboche and then descends to Kayangjuma. After passing through Sansa, the major trail junction to Gokyo Valley and Everest Base Camp, the team disembarks at Phunki Thenga for lunch and rest. It requires a short tough climb from here to Tengboche. We will visit the Tengboche monastery, the largest monastery of Everest region nestled in Sagarmatha National Park, during the afternoon around 3 o’clock to witness a religion ceremony. This day marks the initiation of climb through the Khumbu Khola Valley to Lobuche. The valley begins to narrow after crossing Dusa. The team passes through Phulung Karpo, the camp sites during first successful Everest Expedition in 1953 and Chola Lake on their ascend to Dugla accompanied by the magnificent views of Pumori, Nuptse, Cholatse, Thamserku and other peaks. The trek up the steep terminal moraine of the Khumbu Glacier will commence from here. The team passes through Chupki Lhara and memorial grounds for national and foreign mountaineers descending to Khumbu Glacier and mounting again to Lobuche. The several hours ascend to Kala Patthar sets off before the first day light breaks. Upon the return to Gorak Shep, breakfast is served. The team visiting Everest Base Camp on this day will have early breakfast and start their hike. After the return of both teams, lunch shall be served at Gorak Shep and descend to Lobuche sets in motion. Trekking via Khumbu Glacier, we move to Kongma-La Base Camp at 5,000m/16,404 ft from where we ascend to Kongma-La Pass, the most difficult part of the trek on this day. As we take pleasure in the sounds of prayer flags flapping in the cool mountain breeze, we capture the moments in our memory. Then we begin our descent down to Imja Khola valley followed by another descent to Chhukung, a small summer settlement. Upon our arrival, we check our equipments and prepare ourselves for the ultimate climb on the next day. If we do not want to undertake the Kongma-La Pass route, we can follow another route via Dingboche to Chhukung instead. The trek to Island Peak Base Camp moves through a fairly steep trail where we first climb south then turn east to the main line of the valley. Then the walk on a winding path below the southern flank of the moraine from the Lhotse Glacier begins from where it continues on a pleasant trail along a streamside. The route to the Amphu Lapcha lies to the southeast. A crisscross route through the Imja and Lhotse glacier moraines leads to a wide valley flanking the south west side of Island Peak. The pre-climb training begins after breakfast where the training on peak climbing techniques and the proper ways of using climbing gears such as the ice axe, climbing boots and crampons, harness, ascender, etc. is given by the guides of Bharal Adventure. The training also includes using ropes to go up and down. 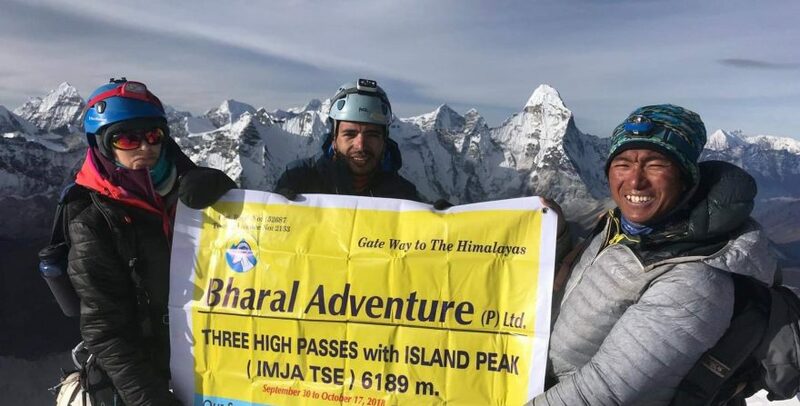 Even though it is not mandatory to have prior training for Island Peak climbing, we, at Bharal Adventure, believe that it will be helpful in boosting up confidence and climbing skills to increase chances of scaling the summit along with enjoying the complete experience. The usual climb takes place on rock surface up to around 5,770m after which climb of ice starts where the ropes could be used. However, the use of the rope and the length depends upon the season and the crevasses. The rest of the day could be spent hiking to high camp and back or resting for the next day’s climb. Waking up at around 12 to 1 am and having the breakfast helps us reach the summit before noon as the strong winds in the highlands in afternoon could become a barrier for a successful summit after that. The trail goes up beyond the base camp for several hundred meters before striking off the steep hillside. The initially sandy path turns to grass becomes becoming boulder strewn again. Climb up the hill takes us to the narrow slope from where the trail enters a steep rock channel. As we climb the rock gully, the route follows a ridgeline leading to an exhilarating and exposed traverse onto the snout of the summit glacier. Here, roping up for the glacier is required because of the several crevasses it contains. The guides will fix a rope wherever necessary from and around here. A steep snow slope will lead us onto the summit ridge where both the fixed rope and man rope will be used for the climb because of the safety reasons. The fix rope of about 350m is used after successfully climbing on rock, however, the length depends on the season as well as the crevasses. Capturing the picture-perfect view from the summit, we descend back to the Base Camp where we have small celebration commemorating the successful scaling of the peak. The descend to the lower altitudes is comparatively easier than the previous ascends. We could either choose descending through the same route as before, we pass the Khumbu Khola Valley, Orsho and Shomare villages or take a different trail to visit the Gompa in Upper Pangboche which is believed to be the oldest in Khumbu region. Retracing the steps down to Imja Khola and up through the forest to Tengboche, we can also plan a visit to the nuns at the Tengboche monastery. After having our lunch here, the walk continues through the hillside blanketed by rhododendron and juniper trees going across the bridge over the Dudh Koshi River following the trail descending rapidly through pine forests from Dudh Koshi gorge to Sansa. Passing through a chorten and encountering (if we are lucky) wildlife such as mountain goats, snow leopards, colorful pheasants, etc., we reach the army camp at Namche Bazaar.